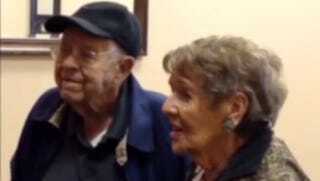 Yesterday 95-year-old Lillian Hartley married her longtime sweetheart 98-year-old Allen Marks. The two, who were both widowed, met at a temple in Palm Springs 18 years ago and have been "living together in sin," as Lillian joked, ever since. They haven't gotten married until now because they've been too busy—they like to travel, go to temple, and watch Los Angeles Laker games. But this Leap Day they finally decided to take the big leap. Lillian said they bit the bullet because, "I don't know what will happen. I want to be together for all eternity, and I'm not taking any chances. We're the Romeo and Juliet of senior citizens." The couple got married in an adorable two-minute civil ceremony at the county clerk's office, and now they're official. What's even more special is that with this wedding they now hold the Guinness World Record for oldest combined age of a couple on their wedding day. Together they've lived a combined 193 years, eight months and three days. Pretty impressive! To celebrate their marriage and their world record, after the ceremony they had lunch at International House of Pancakes and then went back to their condo. They're not off on a honeymoon just yet, but, Lillian says, "We celebrate every day." She added, "I might go to Swiss Donut and have one of the nice donuts." Live it up, girl!